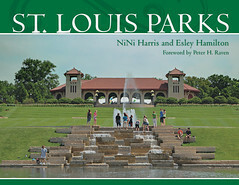 AMONG MANY museums in the Saint Louis region, the Saint Louis Art Museum, in Forest Park, is the most comprehensive, and is one of the most-visited museums in the Republic. 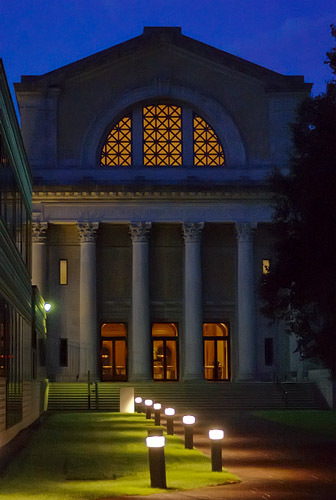 The museum is open until 9 p.m. on Friday nights, and these photos were taken on one such night. 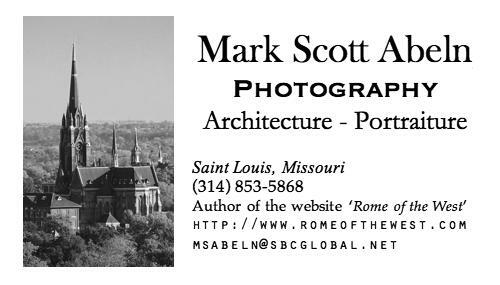 This Beaux Arts style building was designed by Cass Gilbert on the model of the Baths of Caracalla in Rome. 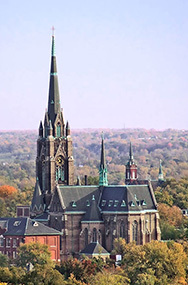 Gilbert, better known for the Woolworth building in New York City, also designed the Saint Louis Public Library main branch in downtown Saint Louis, and the United States Supreme Court building in Washington, D.C. 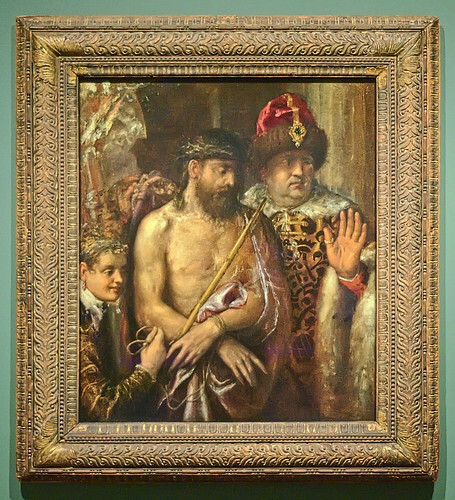 This museum has an extensive collection of Catholic art, some of which I show here. We can debate the fittingness of placing sacred art in a secular museum, but we can still enjoy what is presented nevertheless. 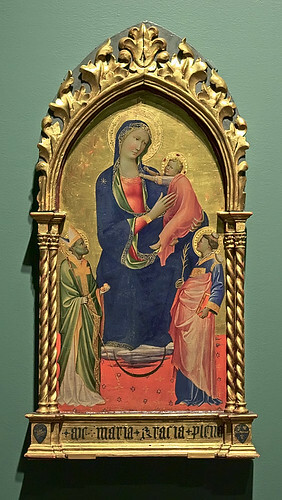 As this is a comprehensive museum, it has art from a wide range of times and places, but structurally the collections give emphasis to the historical patrimony of the visual arts in the United States - and so we can expect a great contribution from classical antiquity and Western Europe. 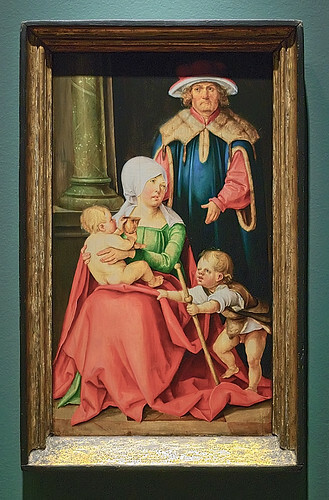 The Catholic sense of High Art and the iconoclasm of the sects deriving from the Reformation ensures that a considerable amount of the historical art displayed is necessarily Catholic. But since the very concept of a museum is a child of the Renaissance and Industrial Revolution, we ought to expect that this Catholic art will be viewed as curiosities or mere aesthetic artifacts of a bygone era. 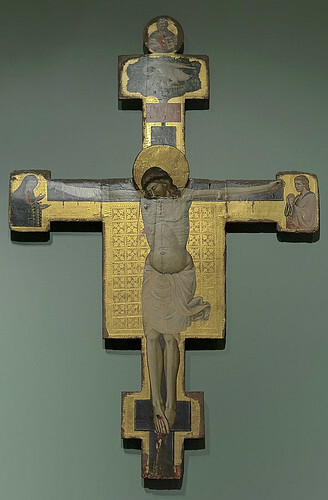 The cheap industrial production of Catholic sacred art in the late 19th century ensures that much sacred art of that period is not worthy for museum display. 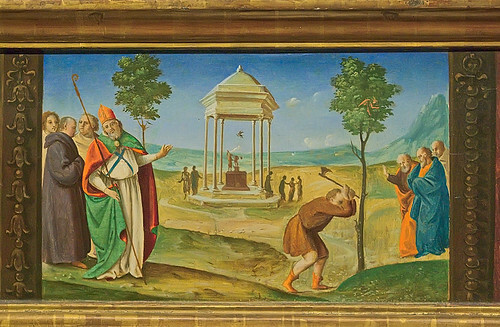 Conversely, the degraded worldly quality of much Catholic church art made in recent decades seems to ensure that this art — not fit for veneration — will end up in secular museums. This is an odd-looking statue, but perhaps it looked better in its original context, being the central part of a painted altarpiece, flanked by the Apostles. This was originally in a convent of the Second Order of Saint Francis, the Poor Clares. The museum says that photographers cannot use tripods, monopods, or flash; sensible rules which nevertheless make photography somewhat more difficult. The photos presented here therefore do not look so good upon close inspection. 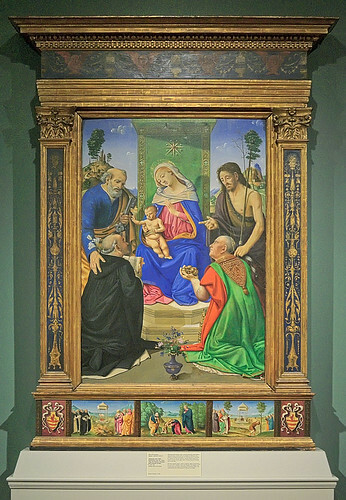 Below the main painting is a predella (Italian, ‘stool’), a word typically used to describe the step or platform upon which an altar is placed, or specifically a series of paintings or sculptures at the base of an altarpiece. 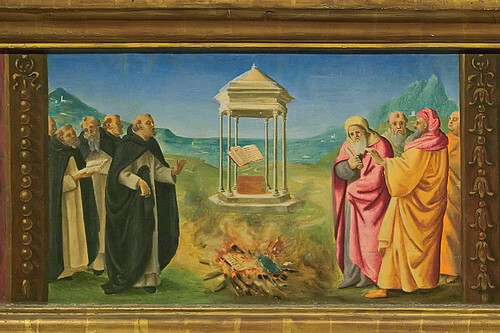 Following are detailed photos of the predella in the above painting. Saint Dominic here appears to be preaching to heretics. 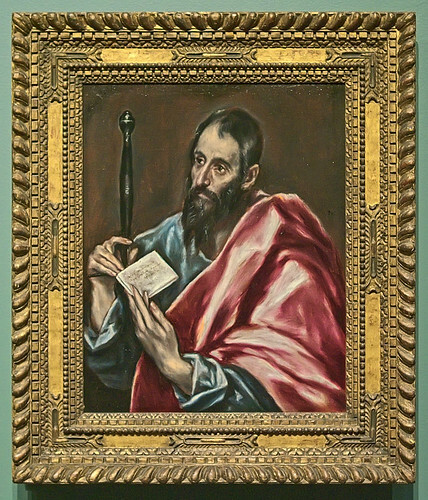 Saint John the Baptist. 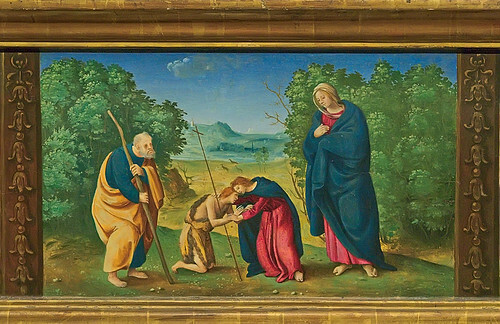 This appears to be Saint John leaving his family to preach in the wilderness. Saint Nicholas of Bari, also known as Saint Nicholas of Myra, or the Wonderworker, and is the prototype of Santa Claus. I'm not sure what this scene represents. This is a remarkably lovely statue, fitting for its subject. This statue is in very rough condition. But keep in mind that the museum curators have a contemporary aesthetic sense, and the original Renaissance museums often housed broken bits of Roman statuary. The artifacts, when new and pristine, were likely quite glorious. I make a good — but not heroic — attempt to portray the colors on these paintings accurately. 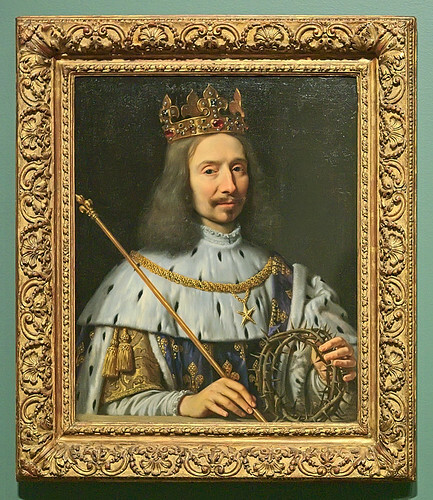 This painting hung in the convent of Mr. Voiture's daughter. The notes accompanying this oil painting state that the painter took artistic license in one specific detail. Can any of my readers identify this artifice? Moorish art style adapted for Christian use in Spain. 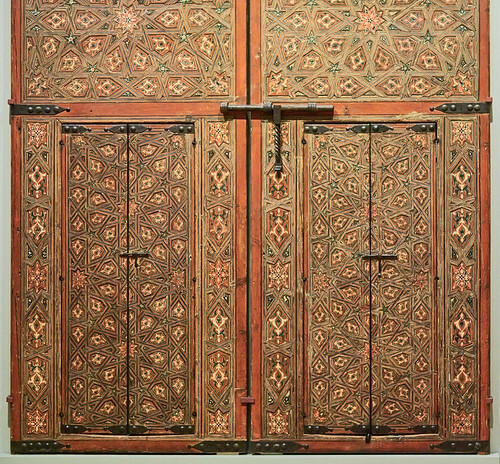 This shows two small doors placed inside of a much larger set of doors. The hardware on the door were originally gilded. 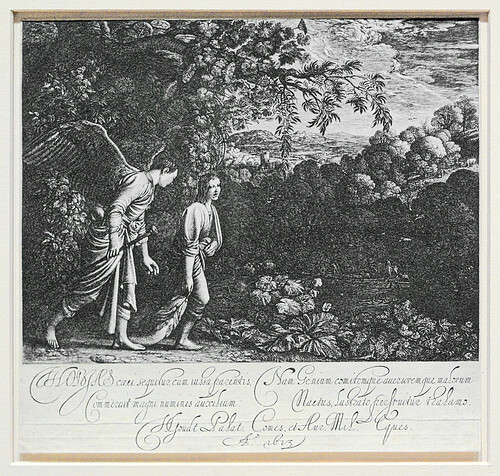 Fancy script makes the Latin inscription on this engraving hard to read. Did the painter move the altar over? It's not centered...uhm where's the big altar in the back? 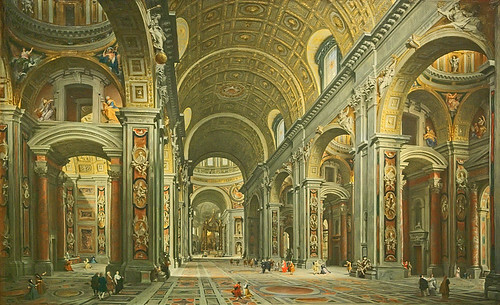 In the Panini painting of St. Peter's interior, the artist has placed the papal coat of arms on the ceiling of the second bay, not the third.